For those who toil in the industries of the industrial park called, Donovan’s, hungry weary travellers lodging at the Crossroads Inn and Suites and those who’ve found themselves on the less conspicuous end of Kenmount Road, Charlie’s Steak House & Bar may be your kind of oasis. Charlie’s is a new building featuring a light coloured, stained wood ceiling that essentially goes all the way to the roof. It has a bar and a dining area that affords a perfect view of the adjacent tractor trailer lot. Kids with a love of trucks – with lots of wheels – will be absolutely over the moon. A toddler in our midst, not yet able to speak intelligibly, seemed to be indicating his approval of a semi by jumping up and down and making whooping sounds. Either that or he was really impressed with our SUV. 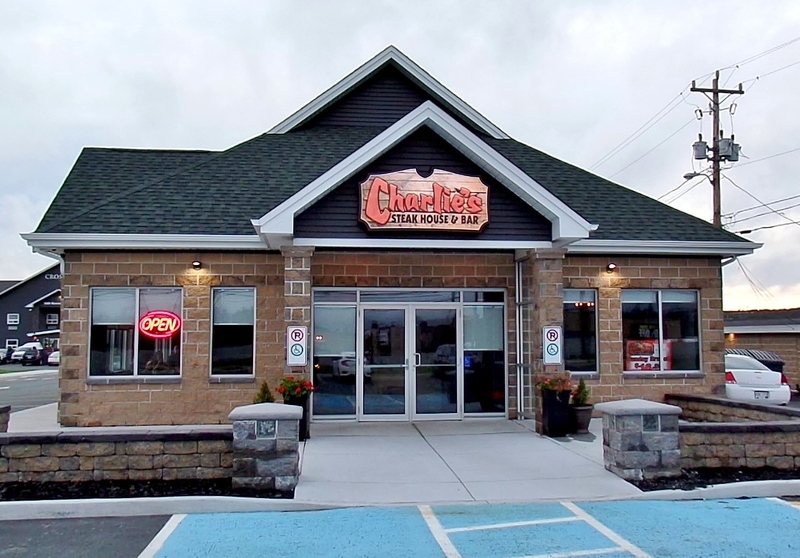 Charlie’s Steak House also has a combination of stand-alone tables and large, comfortable booths – we had a booth – as well as a combination décor of different stained woods, carpeting, sharply cut dark and light stone, and painted walls. Not to be forgotten are Charlie’s contemporary light fixtures, from which emanate an agreeable glow. As its name suggest, Charlie’s Steak House is a restaurant for meat lovers. If you aren’t a dedicated carnivore, you probably won’t find much on Charlie’s menu to satisfy a surging hunger. It’s mostly beef, chicken, pork and a token salmon – grilled – and cod – pan fried – entrée. Three big cheers for Charlie’s decision to serve complimentary bread to its guests. What was once a standard part of restaurant dining has been jettisoned by many eateries in recent years. We were served half a small baguette – enough for four or five thick slices. 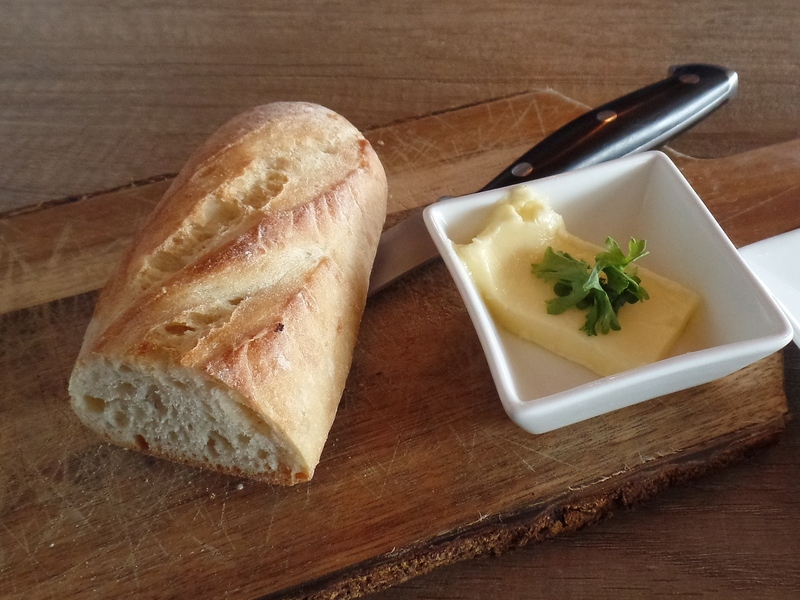 The fresh bread came with butter and a plateful of vinegar-olive oil dip. We began in earnest with one of Charlie’s “shareable starters,” steamed mussels in tomato broth. What can you say about steamed mussels? They’re either large or diminutive, colourful or pale. Charlie’s were small but the Mediterranean inspired broth neutralized any notions of being shortchanged. Rich in massively good cooked tomato and slightly briny mussel juice, the broth made an excellent host for the shellfish. Some soups are made to stimulate the appetite, others are meant to satisfy it. 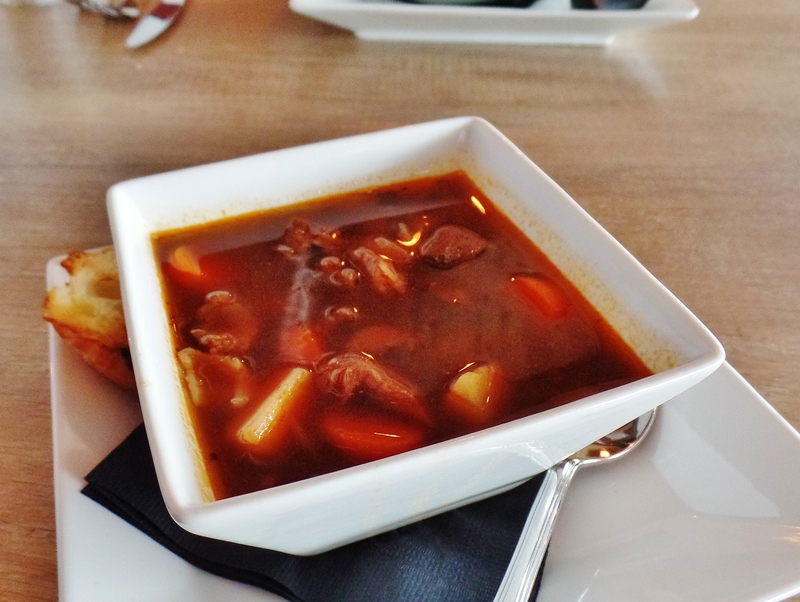 Charlie’s sirloin pepper steak soup crushes hunger. Essentially it was beef vegetable soup. Combining a variety of nicely flavoured root vegetables with excellent quality sirloin steak made this soup far, far from humdrum. It was a robust, well developed broth with enough steak and vegetables to constitute a full meal. Although Charlie’s quarter of roast chicken was a good tasting – and thick – piece of boneless chicken breast, it would have been better if it had been roasted in its skin. Keeping the skin in place is more important in roasting. It protects the meat from drying out and contributes extra flavour. Crispy, golden skin also makes the dish look more appetizing. Charlie’s chicken came with a mixture of grilled, fresh vegetables: carrot, zucchini, onion, celery, broccoli and red pepper. All were perfectly cooked and delicious. When you call your restaurant a steak house, you’d better get your steak right. I’m delighted to say that Charlie’s does get it right, very right. I had a medium rare 12 oz. ribeye. By the way, Charlie’s menu displays a grilling chart that goes all the way from blue rare and rare, to well done and Chicago. What’s Chicago? It stands for “charred outside.” À chacun son goût. My ribeye was indeed, as the menu boasted, “grilled to perfection.” This marbled and highly flavourful ribeye was the best steak house steak I’ve had in years. 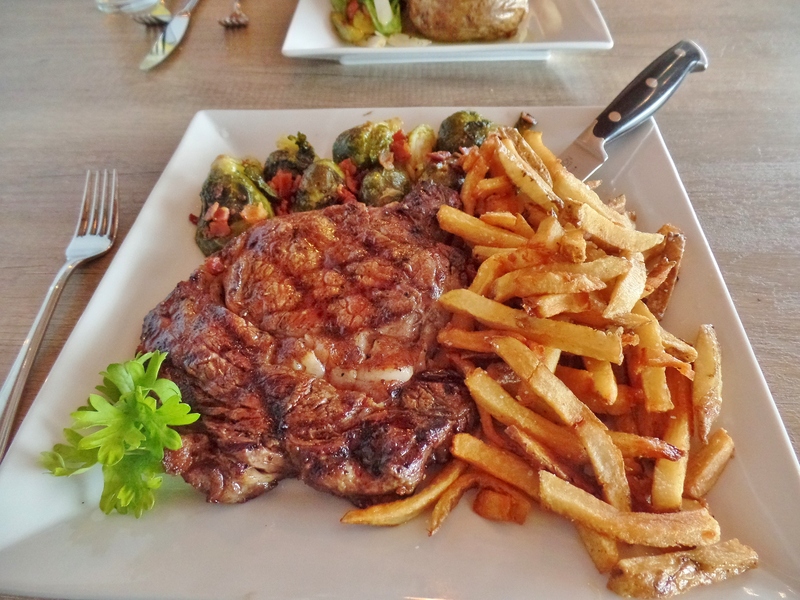 I ordered a side of Brussels sprouts – roasted and tossed in bacon – and fries to go with the ribeye. The sprouts were a tad bitter and the fries a little dry. Charlie’s does not make its own desserts. It serves a variety of factory made sweets such as the summer berry stack I tried. 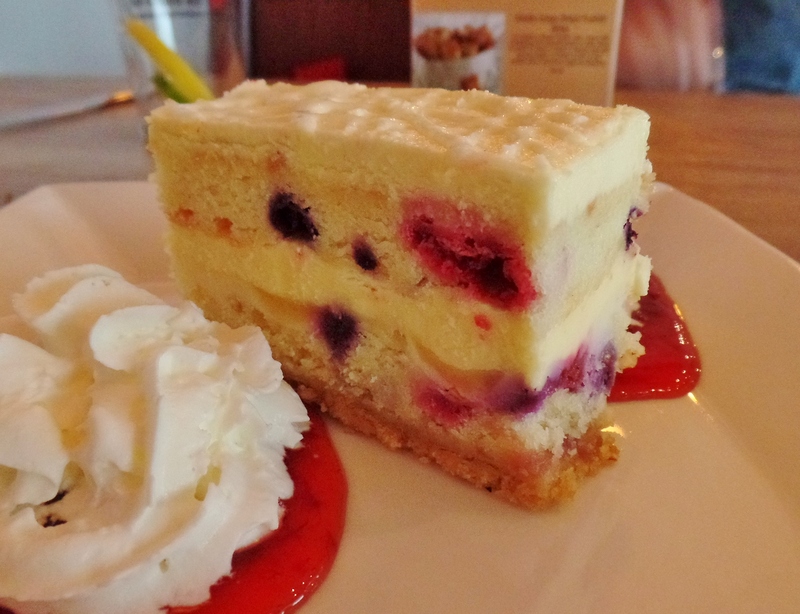 It was layers of cake, berries in key lime curd and white chocolate cheesecake on a graham base. It looked much better in the photograph on the menu. Charlie’s summer berry stack contained far fewer berries than advertised and lacked the fresh taste of a high quality, factory made product. This restaurant lives up to its steak house name. When I go for a steak dinner I want to leave satisfied I’ve had a great piece of grilled meat. I paid $34 for Charlie’s 12 oz. ribeye and it was worth every penny. Price Lunch for two with beverage, tax and tip costs approximately $100. Atmosphere Like a typical, family roadside restaurant. Open Daily 11:30 a.m. to 10 p.m.
Reservations Accepted and walk-ins are welcome. Beverages Around a dozen popular wines with mass appeal, a full range of beers, standard cocktails, coolers, “Hard Liquor” (including Jameson Whiskey) and specialty coffees. Best bets Sirloin pepper steak soup, steamed mussels, ribeye steak. Gluten free options Please ask your server for details.